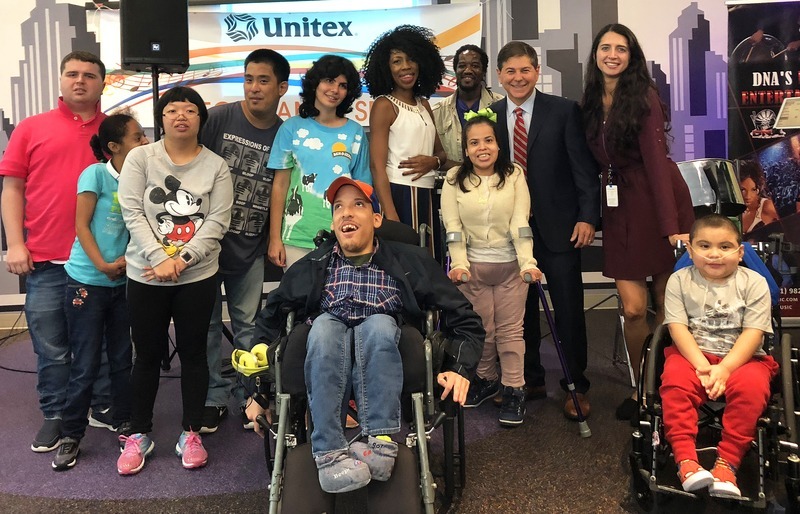 Elmsford, NY, October 2018- After sponsoring a successful Summer Concert Series with various nursing homes and senior assisted living facilities across New York City, the team at Unitex partnered with St. Mary’s Hospital for Children in Bayside, New York to bring music, dancing and pure entertainment to patients. Unitex designed this Concert Series with healing and hope in mind, looking to bring the power of music to everyone. The event in Bayside was proof that music is powerful, as many of the patients got up on their feet to clap, sing and dance the morning away. The concert series was led by the duo Athenia Henderson and Devon Atherley who performed a fun up-tempo set of dance and pop standards with a smooth Caribbean vibe. Known for her powerful voice and cool Caribbean appeal Athenia entertained a group of over 75 children and young adult patients in the medical day healthcare program. The group had a terrific time dancing and singing along with Athenia. It was a truly special day for all.